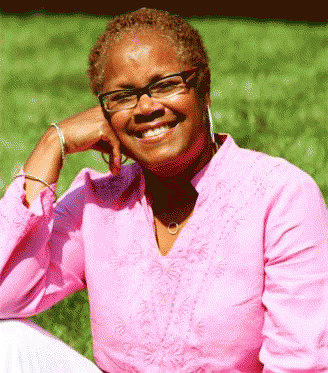 Sharon G. Flake has been a force in writing for children and young adults since 1998, when her first novel, The Skin I’m In, was published by editor Andrea Davis Pinkney at Disney-Hyperion’s Jump at the Sun Imprint. The novel was peppered with accolades, including being named a Bank Street College of Education Best Children’s Books of the Year. 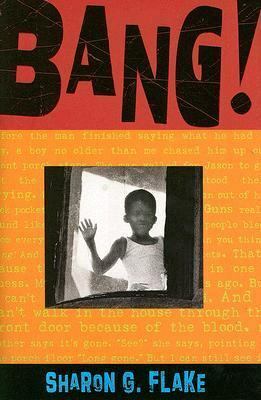 The novel also earned Flake her first recognition by the Coretta Scott King Award Committee, which honored the author the John Steptoe award for new talent. Since then, Flake has published six books, with a seventh, You Don’t Even Know Me, scheduled to hit bookstores on February 16th. You Don’t Even Know Me, a collection of stories and poems, aims to disprove old stereotypes about boys by showing them in a multitude of situations. The book has already been named a Junior Library Guild Selection, with many more accolades sure to follow. We are proud and honored to highlight Sharon G. Flake as a Vanguard author for this year’s 28 Days Later. Like most of your fans, I love your first novel, The Skin I’m In. How often do you get asked to write a sequel, and have you ever considered the idea? According to your website, you wrote your first novel while working at the University of Pittsburgh. Now, you’re a full-time author. What does your typical writing day look like? I’m up early, most times around 7 a.m. but sometimes I get up in the wee hours of the morning say around four a.m. and write. PJ’s are my clothing of choice for much of the morning. I write about three to four hours a day (weekdays). If I’m under deadline, I might write up to eight hours a day, including weekends. I’m answering email , letters, all day long, responding to students, librarians or parents and their thoughts on my work, or scheduling visits. I update my website, check out Facebook, take some time off to watch Divorce Court (I love that show), walk the dog, have tea, back to email, talk with agent or editor or publicist (or all three)…Kicking back and reading a little of this or that is typical as well. And oh yes, I talk to my mom and a few other people who still wonder what authors do all day long. What drew you to write your latest work, You Don’t Even Know Me? I’ve been struggling with another novel for a few years now–my first time doing real brain drain battle with a novel, by the way. The book won, sort of, I put it on hold and decided for my brains sake to do something shorter; another collection of short stories, but this time for boys. Young men always ask me to write something about them. And boys, like girls, are always on my mind. I always feel like we can say more about them, tell fuller stories. That as adults, we can engage them in a different kind of dialogue in and outside of class, and that literature is a great way to do that. Most of your novels feature girls as main characters. Did you have any problems with writing from a boy’s point-of-view in You Don’t Even Know Me? I’m getting this question a lot. But people forget that for almost twelve years now I’ve spent a lot of time with boys–as characters, that is. The young men in my novels have always had a lot to say and have been very present. In Bang! and Who Am I Without Him: short stories and poems about girls, young men talk of many things, love; living with violence; outwitting possessive aunts; working through relationships, grief and lost; and learning to use ones’ gifts for good. In The Skin I’m In there is Caleb and John John and Maleeka’s deceased father. Here is how I see it: Girls and boys don’t live on separate planets. They sit side by side in class, argue at home or on the baseball field, and cuddle on dates at the movies. They are ever present in each other’s lives so I guess from the start I never thought twice about writing from a boy’s point of view. From time to time, however, I’d have to remind myself that something I just wrote was more likely to come out of a girl’s mouth, rather than a boy’s. Your latest two books are collections of shorter pieces—short stories and poems. What drew you to writing this style of book? It’s funny, after I wrote Who Am I Without Him, people said to me, that there was this philosophy in the industry that young people didn’t read short stories. I’d never heard that. I tend to follow my gut when I write things, not trends. When I wrote Who Am I Without Him, I wanted to look at relationships between boys and girls. I prayed about it and the title popped in my head and so I went with it. It’s been a big seller. After that, I said I wouldn’t write another short story collection. I tend to write books and keep moving. What short stories do, however, is allow me to showcase young people in many different ways. For instance, in my new novel, a young man gets married; one boy talks about loving Cinnamon, Chocolate Beige girls while another boy in another poem says white is what he likes. Middle class boys speak up about what it’s like being them, and even younger boys have their say: one talks about what it’s like being stuck in puberty while another says fearlessly, When I am president of the world I’ll move the White House to Harlem, Outlaw guns especially the ones they make to take out you and me. A young man who is used to looking out for his mom, gets chased after by an older woman; while another boy wrestles with getting even and still more wrestle with that thing called love. Fathers play a big role in this novel, too. And not just birth fathers, but step dads, adopted dads, granddads and surrogate fathers. There are so many boys speaking their own truths in this novel, that I think it will spark all sorts of conversations in school, church, at home and community centers. I’m hoping it will help people take young men out of boxes, you know the boxes that say young men don’t read; don’t care about relationships; won’t discuss certain subjects. Can you share some advice for any aspiring authors? 1) Write. It’s the only way to improve. 2) Join a writing group, even if it’s just for six months or a year. There’s something about being in the company of other writers, especially at the beginning, that helps push you along; builds your confidence; helps you understand the industry, and makes you think you can do this writing thing. 3) Pay attention to voice. Every word you write should be read out loud, no matter how many times you re-write. It will let you hear just how authentic your character’s voices really are. 4) Remember when you are writing, you are not leading a parade, you are following one. Be present. Don’t worry about what your character will do next, stay with them in the now and they will take you to the next place. I never know what is going to happen in a short story or novel. I am as surprised to know what will happen at the bottom of the first page or second, as any other reader. If you can suspend your mind and follow your gut than your writing will be fresh and your stories will have their own unique flavor. If I did, some people would have to disappear:-) Mums the word. People will just have to watch and see. Believe me, Sharon, we will! I remember placing The Skin I’m In on the top of a pile of books for my niece, and watching her zero in on that title, pick it up, and wander away. The word “reluctant” in the phrase “reluctant reader” soon after no longer applied to her. I look forward to reading a book that is boy-positive, for sure! A friend recommended The Skin I’m In for my daughter a few years ago and I picked it up when she was finished. I loved it and loved the fact that there was someone out there writing books for and about my brown child. 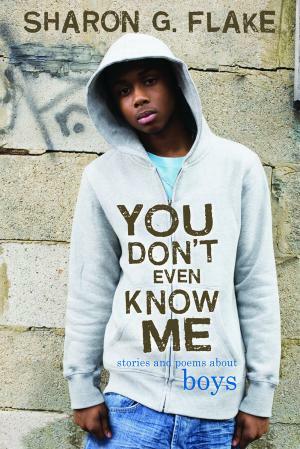 I am excited to read “You Don’t Even Know Me”. As a girl who grew up with a single mom I always felt boys were such a mystery. I hope this book really does give us an inside look at the male mind. I have a few boys and girls in my life who would enjoy this read. 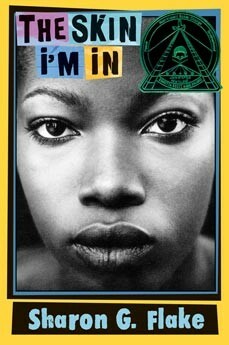 Sharon G. Flake is an amazing author. I’ve enjoyed all of her books. The Broken-Bike Boy and the Queen of 33rd Street is one of my favorites. Look forward to reading her latest. Can’t keep her books on the shelf. When my girls wouldn’t read anything else, I could often put a Flake title in their hands. Thanks for this feature! I hadn’t heard of You Don’t Even Know Me. I would really like to read it. It has a powerful and attractive premise and cover! I especially like Tip #4. It’s going next to my monitor. I am a student from Altgeld elementary school. I am in the seventh grade. I am interested in what inspired you to write your books. I would like to know which of your books is your favorite. Why do you write? Why do you think people write? What was the best thing you’ve written in your life? How do you feel about your writing? can u give me some help on my essay?It’s about you. My name is Chemir Liverpool, I heart your books with a passion. You don’t even know me, The skin i’m in and money hungry. You’re my idol, i hope to be a novelist just like you one-day. Sharon G. Flake is my favorite author. I love how she takes the story and makes it, not just ordinary, but amzing. They always show me a life lesson, no matter what the story is. I have read The Skin I’m In, You Don’t Even Know Me, and Begging For Change. They were all so amazing. I can’t wait till I read all of them.